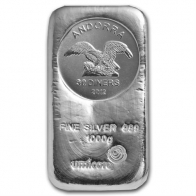 The government of Andorra release a 1 Kilogram silver Andorran coin bar, which is manufactured by Umicore in Germany. This coin has a face value of 30 Dinars, but is in the shape of an ingot, not a round. Coin bars are a popular investment option for European investors. These bars are available for VAT-exempt Swiss storage or for delivery worldwide, and may be purchased using a number of currencies including Bitcoin.